No more raccoon eyes – dark circles can be helped, or at least hidden. Too many late night? Yes, that could be one reason why dark, deep circles mar your looks occasionally. More likely, your genes are showing. Dark circles often are a family legacy – the result of an inherited type of skin or pigmentation. They are a more common visitation on olive skins. (The fair-skinned are less susceptible because they don’t produce high levels of melanin, the skin pigment; and very dark skins, such as blacks’, are also unaffected since the darkness of their complexion makes pigment variations less noticeable). This eye-marrer is often present from birth, and worsens with age as the shedding of surface skin cells decreases and cells absorb pigment from their neighbours – resulting in excess deposits of melanin. But why does the pigment concentrate in the eye area, rather than elsewhere? That’s a question still open to discussion. What we do know is why the pigment is easier to see in this area. The crux of the problem is that the skin around the eyes is very thin with comparatively little fatty tissue or muscle tone. So, when blood passes through this delicate area, it shows through the skin as “dark circles”. Certain things, including lifestyle factors, can make dark circles look darker. Thus, when you are pale and tired for whatever reason – as, for example, too many late nights or lack of sleep – the circles will seem darker in comparison. Allergic reactions that show up in the eye area may cause itching and irritation and the consequent rubbing make the area darker. Exposure to the sun will temporarily further darkens under-eye circles, since the sun stimulates the body to produce melanin as part of its burn defense mechanism. 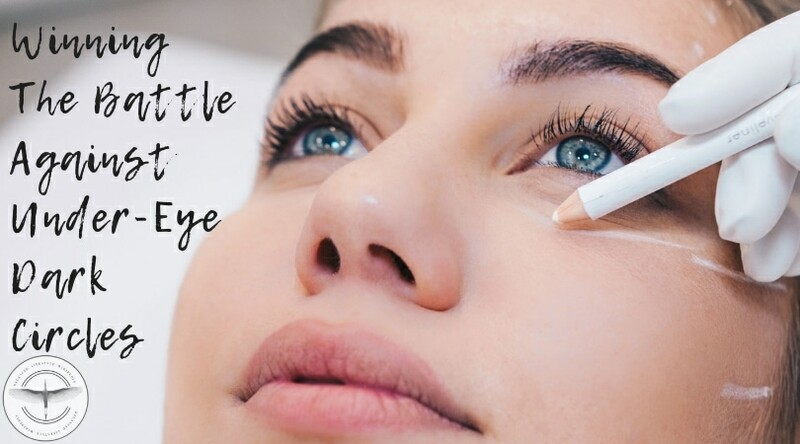 What can you do about dark circles? Hide away! The prime cosmetic recommendation is an under-eye concealer. Choose one that’s just a shade or two lighter than your natural skin tone. Dot the dark area with concealer and blend it just under the lower lid. But don’t overdo. Too much make-up accentuates any wrinkles or puffiness you may have and gives you odd, pale patches under your eyes. Out of Sight! Wearing glasses with tinted lenses is another way to make circles less noticeable. Cover Up! Outdoors, prevent further darkening of the circles by wearing sunglasses with UV-protection lenses. They shield the area from the ultra-violet rays of the sun, thus preventing further melanin production. Strategy with style! A ledge of heavy bangs can cast an additional shadow on dark circles. But pulling hair off the face can also cause trouble, actually setting up too much of a contrast and making circles appear even more pronounced. You’re better off either switching to a side part or, if that doesn’t suit your face, wearing bangs that fall at or above your eyebrows, or wearing wispier ones. Skin bleaching. Those in their 20s, whose circles are budding but not yet extreme, may have preventive success from a skin-bleaching process, done by a dermatologist. The most effective of these involves a bleaching cream combined with a Retin-A cream to lighten skin by a superficial peel. Initially it is applied every night for six months. The regimen is then decreased to every other night for another six months and, finally, continued twice a week indefinitely, depending on need. But it must be done under the supervision of a competent dermatologist. Chemical peeling – the best pigment remover – is a fairly simple and almost painless procedure, performed by dermatologists and cosmetologists. A safe solution of trichloroacetic acid applied to the under-eye area “burns off” the top layers of skin containing the darker pigment. After a few days, a scab forms on the treated tissue, beneath which the skin is rejuvenating. Within six to ten days the scab falls off, revealing new – albeit red – skin. It can take from six weeks to four months for every trace of the redness to disappear. But after the scab is gone, make-up can be applied to camouflage the colour. Once the area is healed, the new lighter skin (also minus fine under-eye lines) will be a much closer colour match to the rest of the face. Choosing the appropriate procedure to correct dark circles carries an added incentive: In the vast majority of cases, once is all it takes.